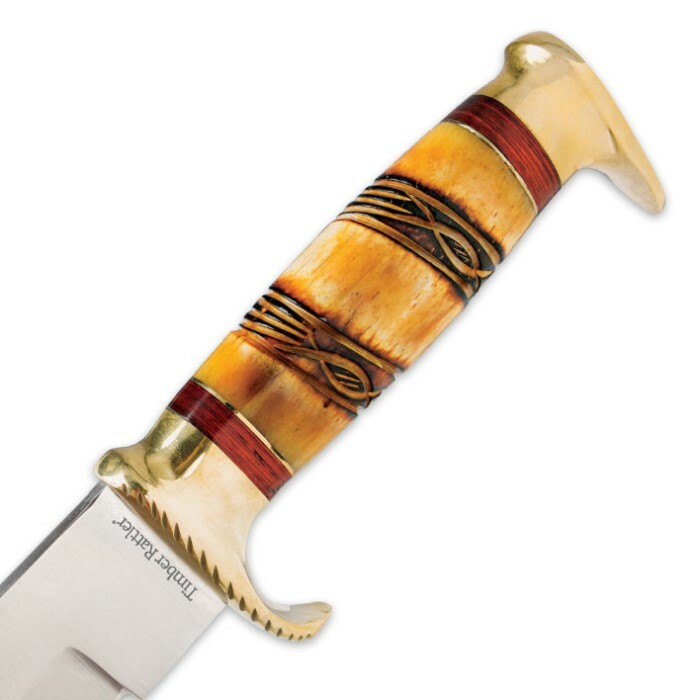 Timber Rattler Amarillo Skies Bowie Fixed Blade Knife Genuine Bone | BUDK.com - Knives & Swords At The Lowest Prices! Expand your knife collection with Timber Rattler's new Texas-sized fixed-blade knife, the Amarillo Skies Bowie. This massive bowie knife features an 11" stainless steel blade with a razor-sharp edge and piercing clip point. The custom-designed genuine burnt bone handle features intricately detailed carvings with red pakkawood inserts and elegant brass spacers. An oversized brass pommel and hand guard with scalloped edges complete the handsome design. A genuine leather sheath is included. This knife is so awesome! Crocodile Dundee would be jealous. I just got mine and I love it. Just what I needed to add to my Bowie Knife collection . Its big, its bad, its beautiful ! Thanks so much Budk ! I like this knife. I think you'll like it too,so get you one! The wow's started before the box was opened! This knife is HUGE! Its got to weight at least 2 pounds. So I open the box and I am greeted by this absolutely gorgeous polished brass and bone handle. Impressive craftsmanship. I pull it from the sheath and there is the massive TR137 stainless steel blade. Feels perfect in your hand. The sheath is nicely made of stitched leather and holds the knife well. I had mine customized the my initials and it looks just that much more awesome! Certainly worth the 5 bucks to have it done. A must have for any collection! Just received the knife. Took it out of the box and it is BEAUTIFUL and VERY SHARP!!!!! The wife came home and saw it, and now I have no knife. She put it in HER Bug Out Bag she keeps in her car. 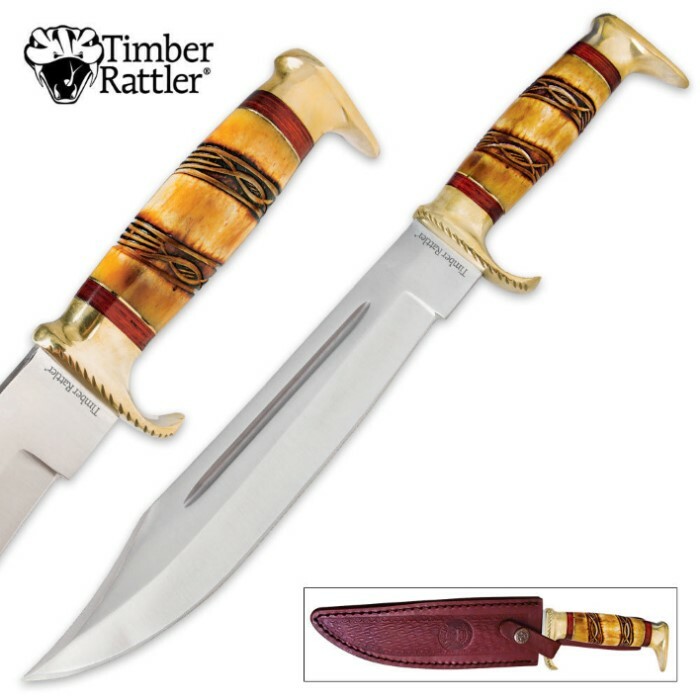 I am going to check out the other Timber Rattlers so I can find one just a little different, but still just as cool!!! The knife is very nice looking and but very poor quality! My handle was pitted and very uncomfortable because a large deep groove/scratch running in it. The scratch was over 4'' long and 1/4'' thick and 1/4'' deep! The blood groove was also way off. It was off center and curved! Might be a bad batch from Pakistan. Now I have to take time out of my day to go and try to get this thing exchanged. I have placed multiple orders with Budk over the last few months and it can really be hit or miss. This one arrive yesterday and as usual . . . . I wasn't disappointed. Timber Rattler continues to turn out high quality knives. I love the handle and finger guard and the highly polished and very sharp blade makes this another winner and a welcome addition to my collection. Bowie Man Dan in northern Maine.